The What: Following its initial introduction to the mobile market at MWC 2018, Dirac Research will showcase its second-generation Dirac VR 3D audio solution to the U.S. market at VRLA 2018, from May 4-5 at the Los Angeles Convention Center at booth 332. The What Else: Dirac’s VR 3D solution possesses a sophisticated 3D audio engine that produces low-latency audio, smooth sound renderings, and highly accurate audio localization in the virtual X-Y-X plane. The second-generation Dirac VR has increased its overall processing efficiency through the further optimization of CPU and memory usage, thereby making it a better solution for power-constrained devices. 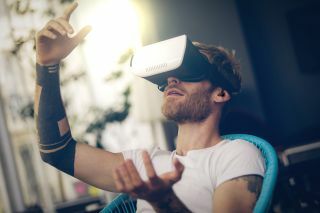 “Enormous potential across nearly all industries will be unlocked with the advent of truly immersive virtual reality; however, this potential and promise will forever ring empty without a perfected 3D audio solution that produces soundscapes that are 100 percent true to life,” said Nadeem Firasta, Dirac’s VP of product management and business development, North America. “After over a decade pioneering digital audio technologies for the automotive, headphone, mobile, and home theater markets, we now possess this 3D audio solution and we look forward to demonstrating to manufacturers, content creators, and end users the worlds that can now be created and experienced with Dirac VR,” Firasta continued. According to the company, the VR 3D solution’s underlying technology is more than 10 years in the making. Dirac’s 3D reverb engine, for example, is built upon a Dirac Unison solution used in high-end automobiles, such as the Volvo XC90, to reproduce in-vehicle acoustics that mirror places like the Gothenburg Concert Hall. In addition, Dirac VR’s ultra-low CPU and memory usage is achieved by leveraging the company’s experience creating digital audio solutions for other low-bandwidth devices such as smartphones and smart speakers. According to Lars Isaksson, Dirac’s general manager and business director of AR/ VR, Dirac VR offers Unity developers a tool to produce increasingly sophisticated virtual reality experiences—ones that involve dynamically moving audio sources positioned around the user on the X-Y-Z plane, separated from one another by as little as one degree. The Bottom Line: Dirac VR’s 3D audio platform is rooted in a proprietary method of dynamic head-related transfer function (HRTF) measurement, which no longer requires individualized measurements of one’s head size, ear shape, and more, in order to create realistic soundscapes tailored to each user’s cranial dimensions.